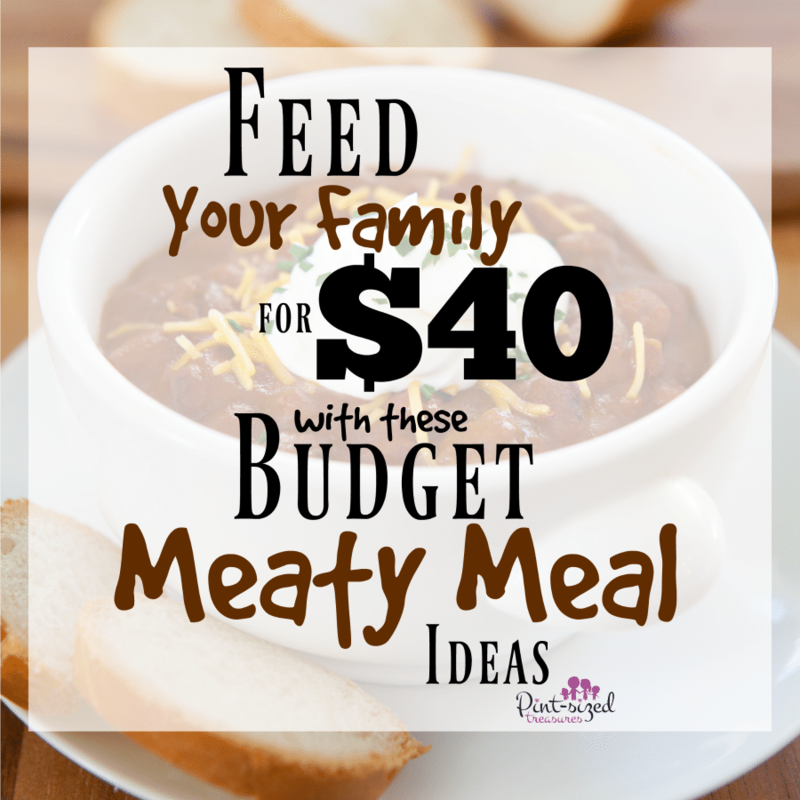 Home › Frugal Living › Feed Your Family for $40 Per Week with These Budget Meaty Meal Ideas! 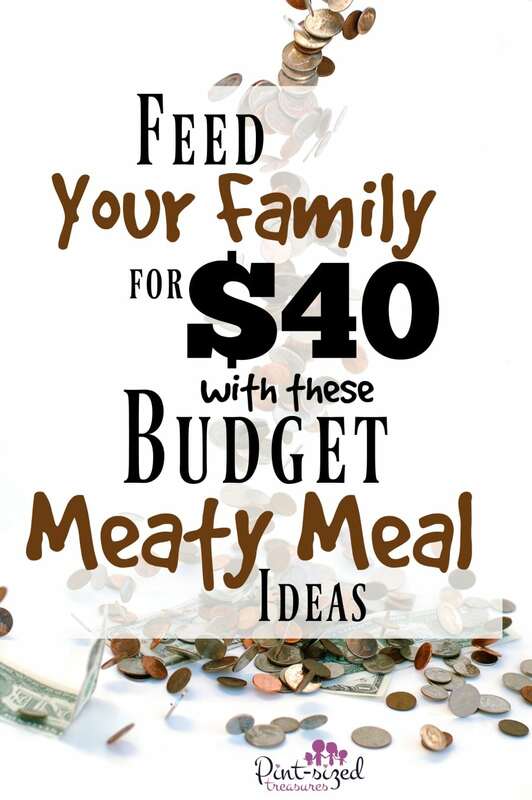 Feed Your Family for $40 Per Week with These Budget Meaty Meal Ideas! Imagine your husband hands you $40 to buy groceries for the week. But, let’s make the skinny budget even more daunting — how about he mentions he wants some meals with “meat”? Run, cry and hide your head in the sand? No, sweet frugal friend, you figure out how to make it work! I’m so thankful for social media and blogs where moms can share their awesome frugal tips! I love it especially when women help other women reach their crazy budget, fitness or business goals! It’s so fun to see others helping each other through financial issues, parenting troubles and other obstacles in life. And I hope you find some of that encouragement here. Take a few moments to look around and check out our marriage encouragement, parenting tips, frugal living ideas, easy recipes and even some super simple crafts! I want your family to enjoy your precious time together and have fun doing it! I hope this helps some mom find relief from her tight budget troubles. But, it’s also a great time to stick together as a family and be thankful for what you do have — each other! When I had to feed my family on $20-$25 a week (yes a family) I didn’t have blog posts to read. I didn’t even have Pinterest to check out meal ideas on the cheap. I had to go the old fashioned route — ask people I knew in real life, check out books from the library and brainstorm like crazy! To save you time, I want to share with you some tried and true tips about how to get some MEATY meals for super cheap! Don’t let your budget stress you out. Enjoy your family and your family’s meals! Shred up some chicken! Shredded chicken goes a long way and you can add it to almost any soup to add a budget-friendly, meaty touch! Look for the bones. Try to buy bone-in leg quarters or drum sticks and thighs. Those cuts can often be found for $0.99 per pound! Think egg dishes! Quiches, Lorraines and even eggs benedict can give you a hearty meal for a fraction of the cost. Add a little bit of bacon or sausage to your egg dish to make it a meaty choice! Add some beans! Most ground beef meals can be thickened up with beans. Cut the amount of meat you use in half and add beans to take the place of the meat. Tacos and soups are the perfect choice for this option! Get creative with hotdogs! Do you know how far you can stretch hot dogs when you add them to fun recipes like pigs in the blanket or saurkraut? I’ve learned that many places in the world often use hot dogs in dishes Americans never think about! We even had a friend make us fried rice with hot dogs — and it was good! Shred up some pork loin! Pork loin, like chicken, is perfect for shredding and adding to meals. I can feed a huge crowd with shredded pork! You can make pork tacos, barbecue and pulled pork sandwiches! Grab some noodles! When you make a cheesy, pasta dish, you really don’t need to add pounds of meat to it. Think spaghetti, Italian skillet, Chicken Alfredo and Hungarian ghoulish! Check out the whole chickens! Don’t be afraid of a whole chicken. If you’ve made a turkey, you can make a whole chicken! I prepare mine just like I make my turkey OR I toss it in my large crock pot and smother it in spices and olive oil. It’s tender, full of flavor and provides a lot of meat. Serve it over rice for a simple meal! Try out some new stir-fries. Stir-fries require very little meat! That’s why the Asians love it so much! It’s cheap-cheap! Grab our simple stir-fry recipe here! Turn your soup on! You can make soup out of almost anything! Just ask my kids! We’ve had lots of “interesting” soups around here! Soups require very little meat! You can make a simple potato soup with potatoes, salt, pepper and add some meat. Add extra spices your family enjoys for a simple soup meal! Make some biscuits! Almost everyone loves a homemade biscuit! We often make these for dinner and everyone can top it with bacon, eggs, jelly, butter or whatever they love on biscuits! It’s an entire meal for us and we use very little meat. Mainly the guys in our family ask for sausage or bacon! My daughters? They go for the butter and honey! Think like a Mexican! Mexican people are smart when it comes to keeping meals low budget. You can get away with a teeny tiny bit of meat in tacos, quesadillas, taquitos and other well-known Mexican entrees. Americans really enjoy the the other toppings so munch, they typically don’t grab a bunch of meat for these well-loved, hearty meals! Grab some rotisserie! Psst! There’s a super sneaky tip, but it didn’t come from me, ok? Some grocery stores will mark down their rotisserie chickens down at night. Walmart has been known to sell their rotisserie chickens for as low as $2 after 9 pm. Keep that on the down-low, k? Here’s a HUGE list of rotisserie chicken recipes to get you started! Toss up a pizza! You can slash pizza prices when you make your own and add a minimal amount of cheese and meaty toppings. This tortilla pizza version is super-cheap AND easy! Become a Greek for a week! Fill up your pitas with a tablespoon of seasoned meat and favorite toppings like hummus, black olives, tomatoes and other yummy goodies! It’s a cheap-cheap, meaty meal idea that hits the “yummy” spot every time! Got any budget friendly ideas to add to the list? Connect with other moms and share your tips in our All Things Mommy group on Facebook.